We’d love your help. Let us know what’s wrong with this preview of Veering Right by Charles Tiefer. In this searing indictment of current administration policy, Charles Tiefer, a distinguished scholar of national legal affairs and former solicitor of the House of Representatives, argues that President George W. Bush methodically manipulates the law to promote right-wing causes. The beneficiaries of these machinations range from frontline pro-weapon and anti-women's right In this searing indictment of current administration policy, Charles Tiefer, a distinguished scholar of national legal affairs and former solicitor of the House of Representatives, argues that President George W. Bush methodically manipulates the law to promote right-wing causes. The beneficiaries of these machinations range from frontline pro-weapon and anti-women's rights groups to major industries that profit from lax environmental standards and military intervention in resource-rich regions. 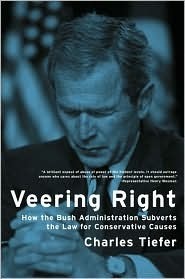 Accessibly written, legally rigorous, and meticulously documented, Veering Right demonstrates how the administration's already-ample arsenal for accomplishing ideological goals was expanded with weapons such as Attorney General John Ashcroft's social crusades and the polarizing 2004 election campaign. Tiefer lays out a compelling case for how the administration consistently erects barriers to media and congressional oversight that might expose covert motivations to public scrutiny. With an eye on the future, the White House is building a durable and potentially dominant machine for pursuing ideological goals by awarding lifetime judgeships and by exchanging favors for campaign funding. This book presents eye-opening evidence that ultra-conservatives could achieve previously unimaginable successes during a second Bush term. As a former Solicitor of the House of Representatives, Tiefer possesses a wealth of insight gleaned from decades of no-holds-barred investigations and judicial struggles. His wide-ranging perspective takes into account cultural changes, constitutional issues, partisan and electoral developments, and political personalities. The most exhaustive analysis to date of the Bush administration’s real agenda, this book provides a rare insider’s view of the strategic, devious, and potentially overpowering ways that presidents make ideological use of the law. To ask other readers questions about Veering Right, please sign up.